Who needs glow sticks when you have water, right? I found this cool little experiment of making fluorescent water and my mind instantly went into overdrive contemplating how I can make use of this interesting fun fact. Well, first and foremost, if you have kids they’ll definitely love this experiment! It’ll be a great way to blow their little minds, especially since it’s so quick and easy to do. 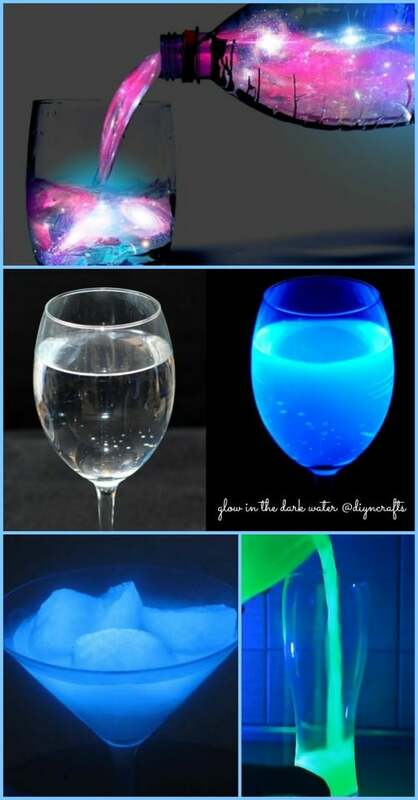 And once you’ve glow-ified your water, you can store it in a bottle and, unlike glow sticks, it won’t fade. All you need to do is take a non-toxic highlighter and cut it open to remove the ink-soaked felt inside. Slice that tube open to release the ink and then just soak it in water for a while or squeeze the ink out if you want it to go quicker. Then you just need to put a UV light (black light) to it and it’ll light right up! Although the highlighters are described as non-toxic, and despite what the video says, I definitely wouldn’t recommend drinking this. If you want someone’s actual beverage to light up which they can still drink safely, just pour them a glass of tonic water and bring that to the UV light. The tonic water will light up on its own! Although the bright blue glow may make it look radioactive, we all know that tonic water is safe to drink. Tonic water contains a chemical called quinine that comes from the bark of a specific tree; this natural-occurring chemical has actually been used to treat malaria for centuries. Even though there is such a small amount of the bitter-tasting quinine dissolved into the water, when under a UV light, it emits a fluorescent glow all on its own. Use tonic water with quinine and it will do the same thing yet it is safe to drink. ya, but if its not under blacklight will it still glow? whats the point if you cant use it w/out the blacklight? Wow your really really good!!!??? How would you tell if the tonic water is tonic water from a blue highlighter? cool is it a chemical change?